U.N. Security Council Elects Five Members For A 2-year Term: The United Nations General Assembly voted on Friday to elect Germany, Belgium, South Africa, the Dominican Republic and Indonesia for a two-year term in the Security Council starting on the year January 1st, 2019. The council is the only U.N. body that can make legally binding decisions and has the power to impose the sanctions and authorize the use of a force. Indonesia draws more votes than the Maldives in the contested election for one Asia-Pacific seat by the 144 to 46. Other four candidates are runs unopposed. Uncontested candidates still need to wins more than the two-thirds of the overall General Assembly vote to be elected. There were 190 ballots in the Friday’s election. Indonesia is the world’s biggest Muslim-majority country that will pursue a comprehensive global approach to the combatting terrorism, radicalism, and extremism during its term, the foreign affairs ministry said in a statement. Palestinian issues will also be Indonesia’s concern during its non-permanent membership,” the ministry said. Germany received 184 votes, Belgium had 181, South Africa got 183, and the Dominican Republic had 184 after one round of the voting. Regional groups generally agree upon the candidates to put forward, and competitive races are increasing in rare cases. In a typical year, the General Assembly elected the five new members, which join the five chosen the previous year and the five permanent. 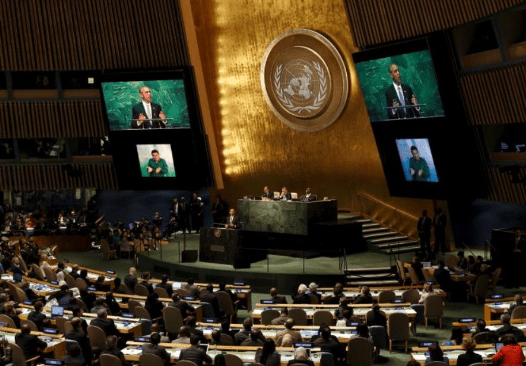 Veto-power seats: The United States, Britain, France, China, and Russia. The five members who are giving up their seat at the end of this year are the Netherlands, Sweden, Ethiopia, Bolivia, and Kazakhstan. The five seats not up for election this year currently held by Ivory Coast, Equatorial Guinea, Kuwait, Peru, and Poland. So, these are the points to describe on the U.N. Security Council elects five members for the 2-year term. Please suggest your comments on the Article as mentioned above.